Learning more about weight loss maintenance – what works and what doesn’t work? The best way to help people lose weight and keep it off is to develop programmes based on solid evidence of what works and what doesn’t work. At the moment, we don’t know enough about how people maintain their weight loss, or why they regain weight, to develop really effective programmes for weight loss maintenance (WLM). NoHoW researchers will tackle this problem, building the evidence base needed to put WLM research on a firm scientific footing, and building and testing the NoHoW Toolkit for WLM in the UK, Denmark and Portugal. What will we do with our results? We will share what we learn with a wide range of key audiences, including other researchers, health professionals and the general public. How we will communicate our results will be tailored to the audience but will include online channels (website, social media), print media (brochures, press releases, academic publications), representation at events (academic conferences, exhibitions, final NoHoW workshop conference), and interactions with related projects (workshops at key meetings). We will also interact with consumers and patients through the European Association for the Study of Obesity (EASO) Patient Council and with experts through the EASO Scientific Advisory Board and Task Forces. 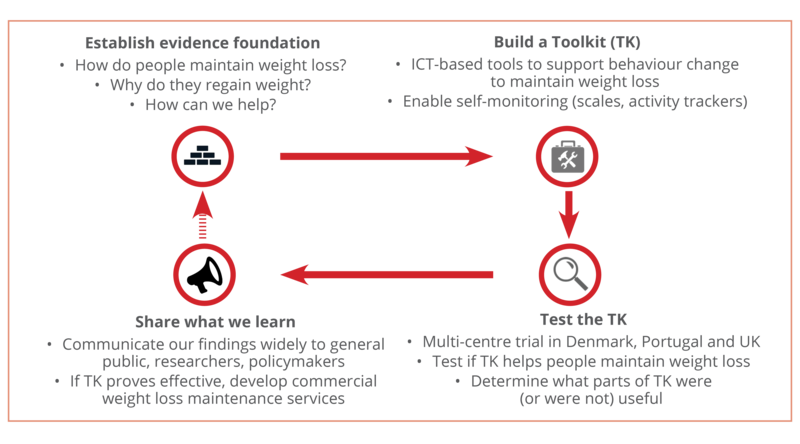 What we learn about the Toolkit during the project will also be used to develop weight loss maintenance services. A business plan, including market research and branding, will be co-created by the NoHoW team and key health and policy stakeholders. We will also create international networks of communication and practice to promote a new generation of WLM services. Activities to establish the networks will include marketing, workshops, websites, sponsored symposia at international weigh loss and obesity conferences, and co-branding with key stakeholders, such as EASO, the World Obesity Forum and others. The aim will be to being the right people together to develop and share best practice for the prevention of weight gain and regain.